When the excitement of the holidays is over and we’re faced with 2-3 more months of winter, parents find themselves digging deep into their bags of tricks for ways to entertain the kids. Indoor crafts and play dates can get old, so here at Pear Tree Greetings, our cure for the winter blahs is to give ourselves something fun to do—like planning a winter party! 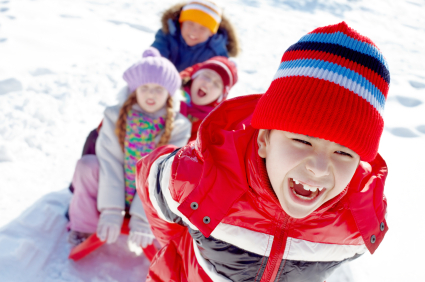 There are plenty of winter party ideas for kids that take the worst of winter and make the best of it. What child doesn’t love a sledding party, especially if there is a cup of hot chocolate waiting when they come inside to warm up? Want to go bigger? Local parks in many northern states have “tubing” hills, complete with innertubes and tow ropes that take kids back up the hill. Ice skating, building snowmen, and renting snowshoes for a trek through the woods are other fun options, at least where there is snow. No snow? How about taking the kiddy crew to your local indoor ice rink for an open skate, or even renting the rink for your own private party? Indoor trampoline parks are springing up everywhere and indoor play spaces like these are also great for winter party ideas, or just to give kids some exercise when it’s cold and wet outside. Kids who are lucky enough to have a birthday party in January or February are used to coming up with winter party ideas. Why let them have all the fun? Start planning a winter party now and by the time party day arrives, spring will be right around the corner. Keep reading our blog for more fun kids ideas. Or peruse our kids birthday invitations and adult party invitations for more party ideas. You don’t need a winter birthday to have a winter party!